I grabbed one of each immediately. They were a steal AND the artistry is right up my alley. 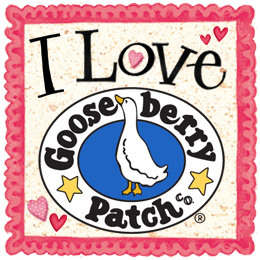 A little Susan Branch, a little Gooseberry Patch. And homecookin’ cookbooks nonetheless. Mine. So I grabbed 2 more of each. Greed? Not exactly. A set for me, a set for my sister, and the remaining three? Well…you’ll have to wait and see about that. Hint: Anyone else love homecooking, cozy cookbooks, and giveaways? Okay, spilling the obvious beans: so FINALLY I’m going to have my first giveaway! I may be the only soul excited about it, but I’ve waited to have a giveaway where I share something I adore. And these delightful books? Adore. I am a sucker for cookbooks. 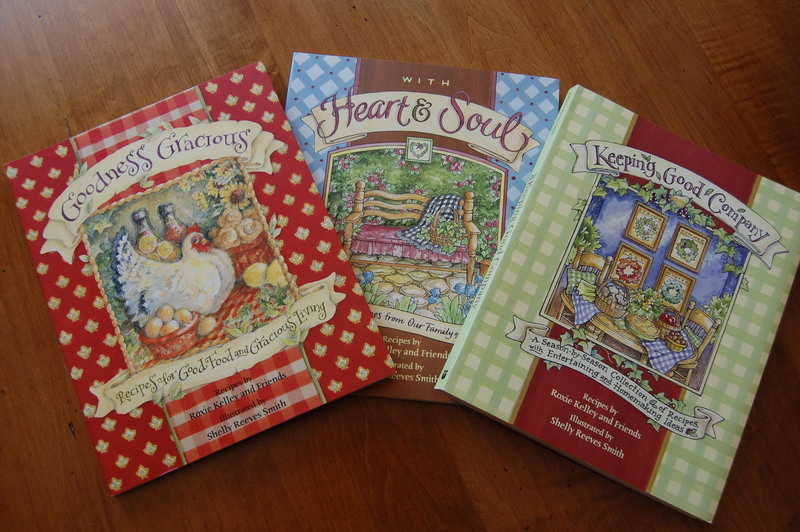 But if the cookbooks have original artwork and handwritten recipes topped with stories of family traditions, neighborly love, and cozy family life? Get outta my way then, folks–those types of books are like my addiction. I need them. 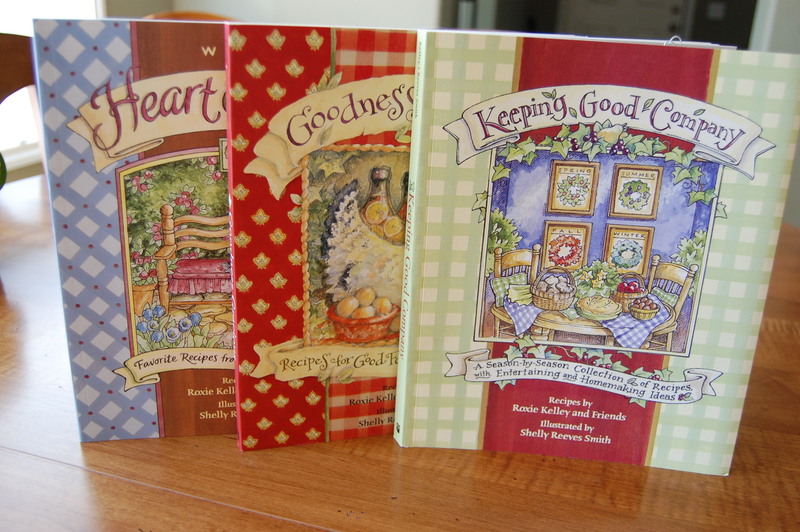 And the collection of books by Roxie Kelley and illustrated by Shelly Reeves Smith are just such books for me. 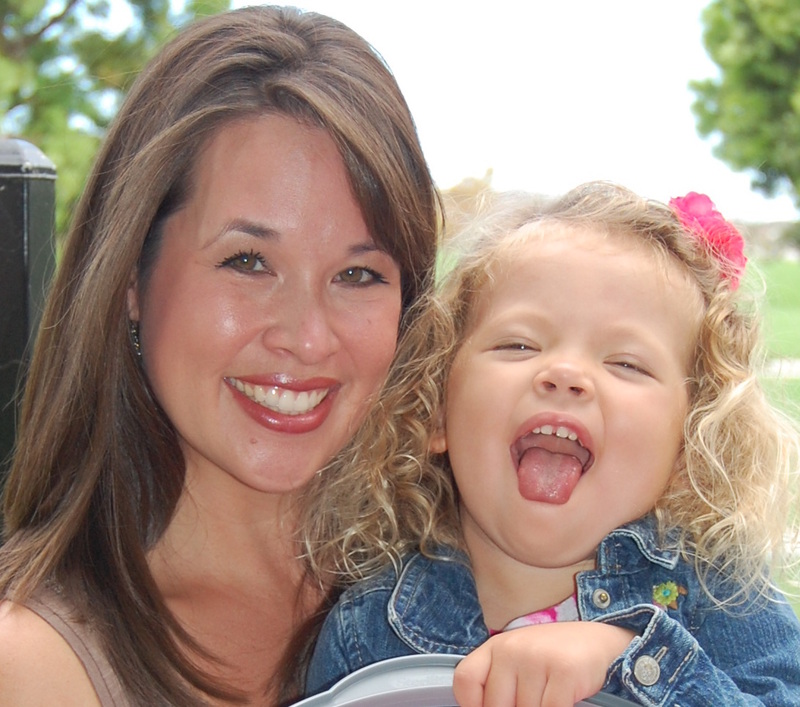 I found sweet treasures to read, cook from, and pass down to my little girl one day. In any case, here is the recipe for this scrumptious little cake. It is not as crumb-like as other crumb cakes I’ve tasted nor is it very coffeecake-esque. See the bottom layer? Smooth. A good smooth. Not crumby. All crumbiness is on top. 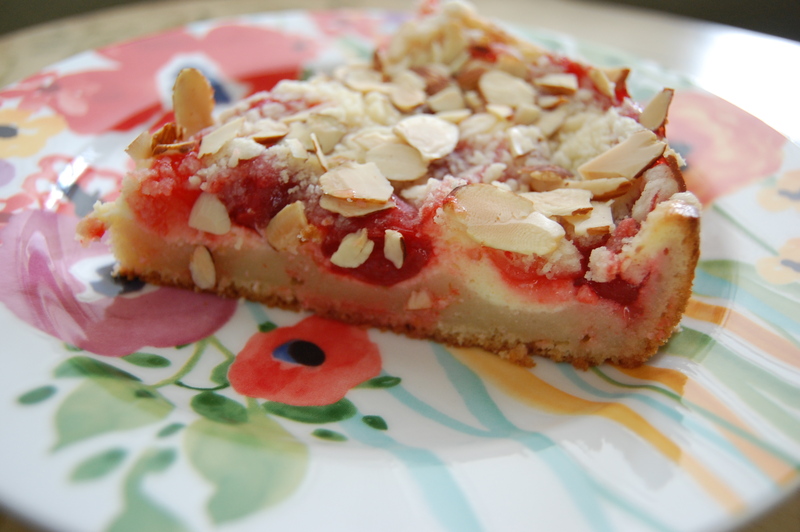 You get a little bite of almond and crumb crunch from the top, then the simple, almost custard-like taste from the other 2 layers, stacked with the slight tartness of the cherries. This recipe calls for canned cherry pie filling. I happened to have one on hand, but this would also be delicious with a quick homemade cherry filling. I made a couple slight changes to the recipe because I can’t resist lemon and extra vanilla extract. 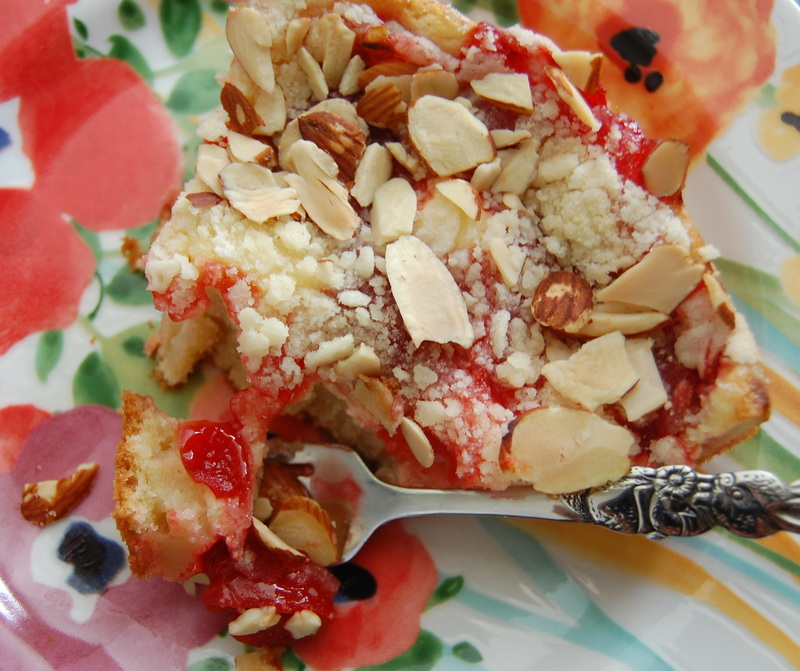 We enjoyed this as dessert since I made it well after breakfast, but it would make a lovely breakfast treat, brunch sweet, or tea time accompaniment. Preheat oven to 350°. Grease an 8 or 9-inch round cake pan. 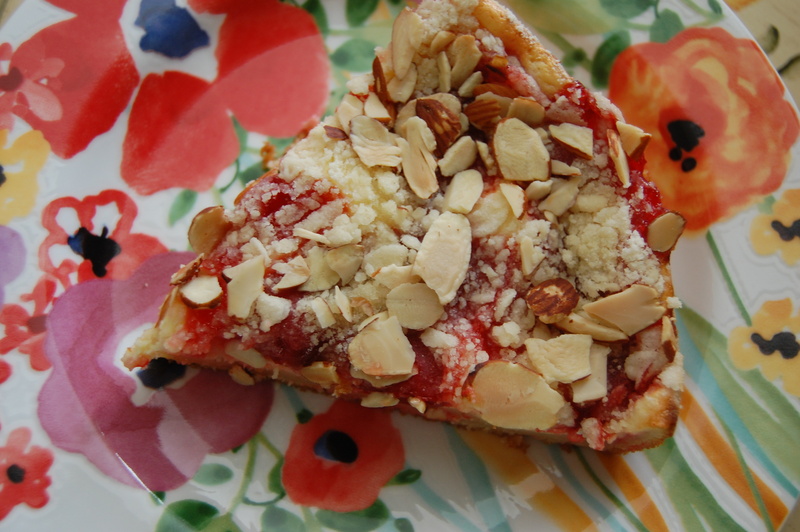 Place almonds in one layer on a baking sheet and place in oven. Toast until lightly browned, checking often and tossing a bit after 5 minutes to evenly toast. Toast an additional few minutes as needed. Remove from oven and set aside. Combine the flour, sugar and salt in a large bowl and then cut in the cold butter until it has a crumbly texture like a coarse meal. Remove 1/2 a cup of the mixture and set aside. To the remaining mixture add the baking powder, baking soda, sour cream, milk, vanilla, 1 egg, and lemon juice. Beat with a hand mixer on medium speed until well blended and smooth. Pour batter into the greased cake pan. Mix the cream cheese with the sugar and remaining egg. Beat with hand mixer until smooth. Spread this batter (yum) over the other batter in the cake pan. Then, by spoonfuls, drop the cherry pie filling all over the batter until it is evenly distributed. Sprinkle crumb mixture evenly on top. Bake for 30-45 minutes (oven temps vary) or until the cake bounces back when touched in the center. 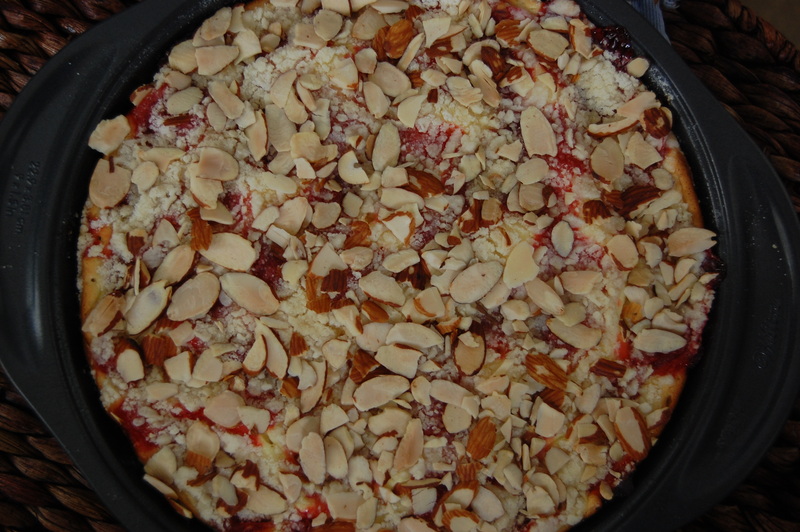 About 3/4 of the way through cooking time, sprinkle toasted almonds on top of cake. Cool before serving. We preferred this slightly warm. Enjoy! 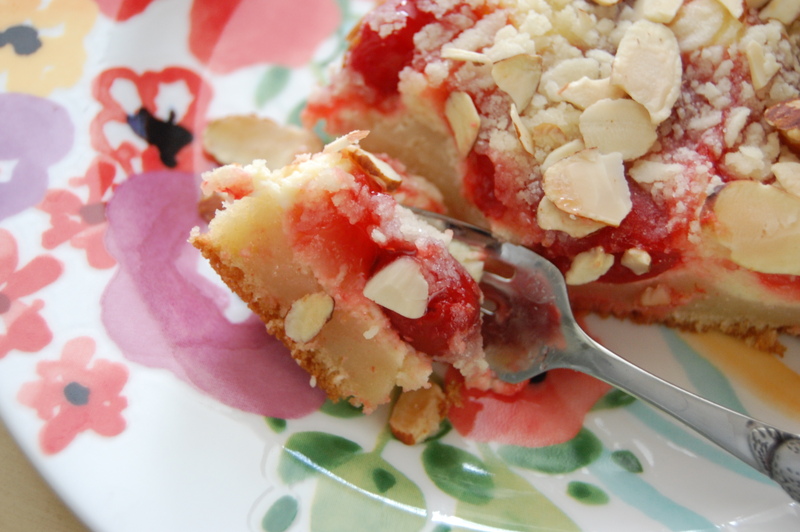 Note: You could opt to not toast your almonds before baking and just top the uncooked cake with the untoasted almonds. I just prefer my almonds toasted slightly beforehand. 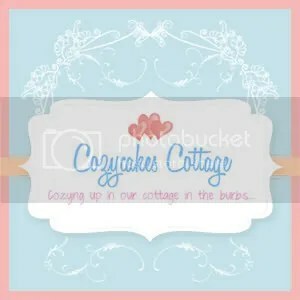 I love all the recipes and great ideas you have on your blog. Keep it up! That does look amazing! Wish I had a piece with my morning coffee. Thank you 🙂 Sending a slice your way! This looks really, really delicious! Thank you Michael Ann! And thanks for stopping in! This looks very yummy! I will be sharing it on my facebook page. Thanks for linking up to Foodie Friends Friday Linky Party!